Looking for proven professionals in Washington Township commercial electrical contractors? Try the team at D.P. Murt Inc. We’ve been providing electrical installation and maintenance services to businesses throughout South Jersey for over 30 years. D.P. Murt Inc. is based in nearby Pennsauken and is veteran-owned, and clients come to us because of our attention to detail and our track record of getting the job done on time and on budget. Commercial Services. If you own a restaurant, operate an office or apartment complex, or own any other type of facility, we can replace your existing, outdated system with a state-of-the-art new one to keep your business running and save on energy bills. We’ll help design and build your system to your needs, including telecommunications systems and energy conservation audits. If need be, we can install a brand new generator or HVAC wiring system. Industrial Services. 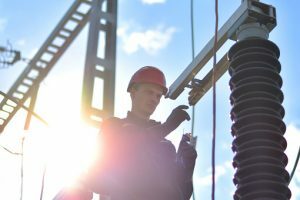 Our trained experts can install and maintain an electrical system for your plant that keeps business running and minimizes expensive shutdowns. D.P. Murt installs power wiring, generators, emergency systems and most varieties of circuits. We also handle security and fire system maintenance, to keep your employees and plant safe. Institutional. D.P. Murt specializes in both installing new electrical systems and repairing or upgrading existing ones. We offer energy-efficient lighting to save on your expenses, and we offer green technology solutions such as solar and wind energy that reduces carbon footprint. You can learn much more about how D.P. Murt Inc. can improve your power and energy systems by clicking on the Services tab of this website. If you’d like to know more about our pricing, click here for a free survey and to meet with our team. See why D.P. Murt is the smart choice for Washington Township commercial electrical contractors. We take care of the power so you can take care of business.